Let your dream job come to you with JobTabs Job Search and Resume builder 2013, a professional resume-writing software which has been for many years. If you desire to find a job in these competitive situations, then JobTabs Job Search will help you in improving, organizing, and assisting your job search. Because a good ‘Resume’ will increase the attention of recruiters, emphasizing your organizational and professional skills. 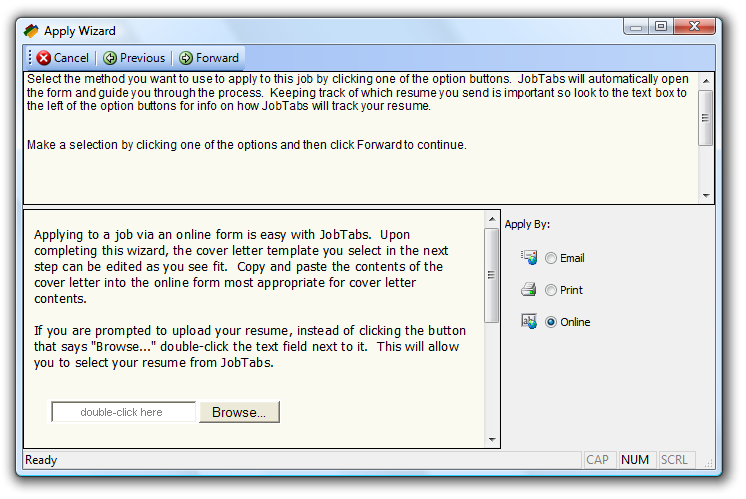 JobTabs Job Search and Resume Builder 2013 works like a miracle with a wide range of resume templates and options. It helps you in preparing resumes in an easier, faster and error-free manner. As soon as you install JobTabs, it will search online for any latest updates and automatically installs them. The interface under the main window has tabbed-menu which includes Recruiters, Employers, Networking, Resumes, Resources, Reports and Jobs. A detailed “Help” file has everything you need right from its features such as creating resumes, stimulating guides, common interview Q & A, interview errors, and many more. Easily creates and manages resumes, cover letters, and contacts thus saving the job search time. Compose perfect resume for you based on skill criteria such as soft skills, communication skills, professional skills, organizational skills, experience, education and career goals. Job Application wizard makes your life easy in finding forms and applications quickly. Create “Search Agents” and get rid of repetitive typing. Save all job postings online to JobTabs Job Search and check out later. Integrated email and cover letters. Get related jobs and expert advice daily through RSS Feeds. Works well with Facebook, Twitter and LinkedIn. Videos on what-to-do and how-to-do. 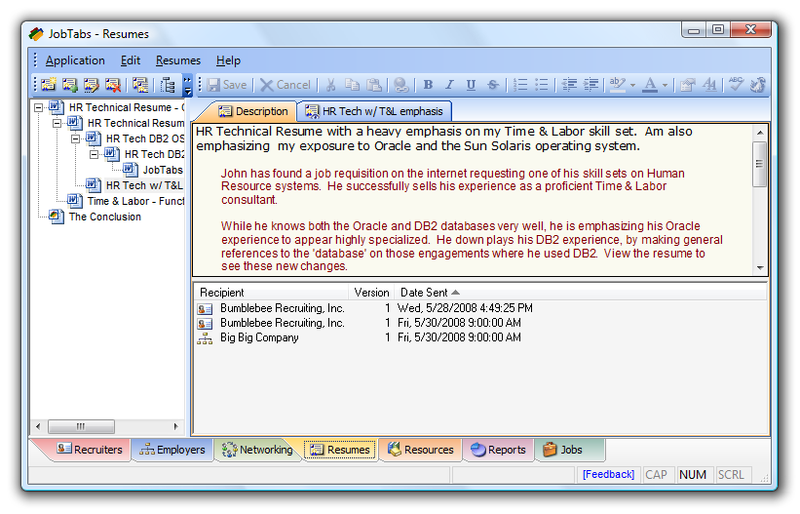 Shows you the sample resumes in understanding the resume format. The main problem for job and career aspirers is its 14-day trial which is very limited to try. 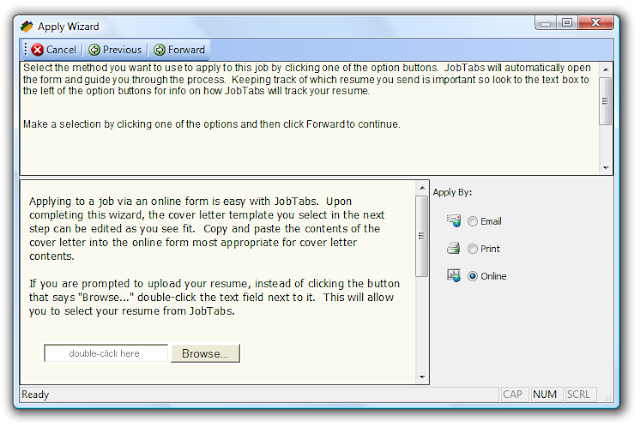 Download JobTabs Job Search and Resume Builder 2013 v5.0 trial version or buy it for $50. Check out the job search videos and online help file with loads of job search and interview tips.